With next month seeing the 45th anniversary of the release of Pink Floyd's iconic The Dark Side of the Moon, an increase in coverage of this album is bound to happen as March approaches. One of the first (if not THE first) of the items of interest, is now available in Germany. 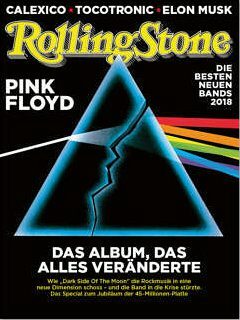 The localised version of Rolling Stone magazine has a cover feature on "The Dark Side Of The Moon - The album that changed everything" with a suitably intriguing graphic to help it stand out on the store shelves. In the preface to the article, Pink Floyd: The crack in the moon, they note that "In 1972, Pink Floyd began recording The Dark Side Of The Moon at Abbey Road Studios, which became one of Rock's most famous and best-selling albums - and the last album they co-produced conciliarly. 45 years after its release, Arne Willander traces the path of the groundbreaking work and the first cracks in the band." For more information, visit RollingStone.de. Our thanks as ever to Michael Nickel for his help with sharing information on Floyd related things.